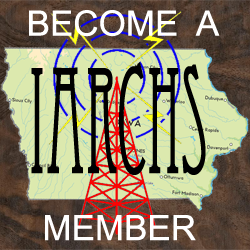 A regular meeting of the Iowa Antique Radio Club convened at 10:15 at the home of Rob Tracy in Des Moines. 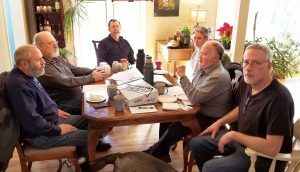 Those attending included Rob, Al Bailey, Bob Elbert, Dwight Baker Keith Lowe and, thanks to Keith, some new, younger members Joe Arling, Thomas Logan, Brodie Miron, Preston Peddicord and Stone Widder. The minutes of the last meeting as posted on the website were briefly discussed and accepted as is. There was no treasurer’s report available, however, as there had been no significant club activities since the last meeting the likelihood is that the current account balance is about the same as reported last time plus a little earned interest. Under new business, the status of the upcoming auction was the major topic. It is important for members to note that the web site is now up to date and ready to accept pictures of consigned items . Please get all pictures of items you will be offering for sale to Craig Huseboe at cmhusebo@marshallnet.com. You will also need to request a lot number for your items, so please also get that from Craig. In a related note, Craig has said that this will be his last year acting as the auction coordinator as he & his wife plan to become snow birds beginning next winter. (…. and given how THIS winter has been so far, who can blame him !). I asked if anyone present would consider taking on the job, Dwight Baker said he was willing to continue assembling the item spread sheet but did not want to expand beyond that role and no one else stepped forward. So please give it some thought and contact me if you’re willing to help your club out. It would be a very good idea to get involved sooner rather than later so whoever takes over can benefit from what Craig has learned doing it for the last several years. Craig has been in contact with Brent Wears and it’s been agreed that all of the fees will be the same again as last year. The auction is set, again this year, for the last Saturday in April, as stated on the club calendar. However due to some feedback from attendees we will probably be moving it back to the 1st Saturdayin May. In other business we discussed the need for everyone to make better / more use of the club’s online resources, especially the website as a place to seek and ask for assistance and parts for a restoration project. One of the most frequently requested services directed at the website is from someone seeking repair services. While we do have some contacts for repairs in central and eastern Iowa, there is a need for someone closer to Nebraska, so if any member knows of a person or if YOU are willing to provide restoration services in western Iowa or in Nebraska, please contact me with the information. I’ve also noticed that our Facebook page gets relatively little traffic – please keep in mind that, that’s also available as a place to share information and, perhaps, request help with a specific problem. Finally, we need a volunteer to host our next meeting. As this will be the last one before the auction earlier would be better than later. Around March 24thwould be a good day, but a week either side would probably serve too. As this meeting was in Des Moines, for the benefit of our members in Cedar Rapids, Iowa City , Dubuque, etc, it would be good to meet somewhere east of Des Moines this time. With that, the meeting was called to a close and we rolled into a repair / training session. In relatively short order we were able to identify the source of noise in a set brought by one of the new members and point another to the cause of a dead spot in the tuning range of a radio he’d been working on. 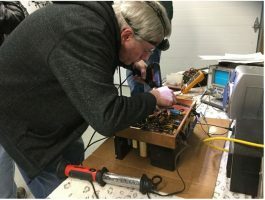 As there is always a desire to learn & develop repair skills, Rob set up a good assortment of test equipment to demonstrate how to use a signal injector, a signal tracer and an oscilloscope. 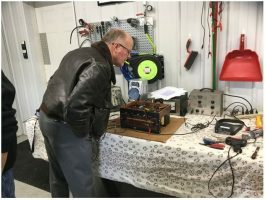 He also provided a carefully ‘broken’ radio to use as a teaching challenge for any and all that wanted to do some troubleshooting thereby demonstrating in a very practical way how to approach it for the newer, less experienced members. It was a good, productive training/ repair session and we wrapped up around 3 PM. Please contact me to host it and take on the job of auction coordinator in 2019 – your club needs you ! Happy New Year everyone, I hope you’re all warm and comfortable in you winter workshops surrounded by projects (glowing tubes make nice little space heaters you know). 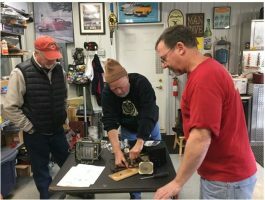 I want to remind you all of the club meeting / repair session we have coming up. When: Saturday Jan 13th from 10 AM until whenever . lunch will be provided Please RSVP Rob at robsradioactive@gmail.com and copy me at spamhole1951@gmail.com so we know how many plan on attending. 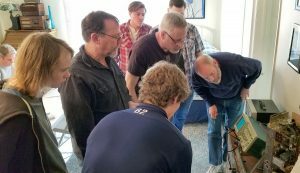 What: A brief business meeting followed by a hands-on repair session for those wishing to work on / learn radio restoration skills or wanting another set of eyes to look at a tricky restoration project. 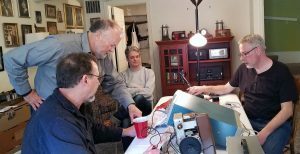 Bring your projects and plan to share some time with fellow antique radio enthusiasts. I hope to see you all there . 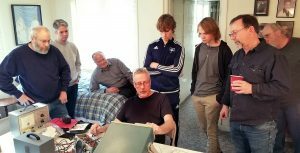 A club meeting was held at Dave Perkins’ home south of Marshalltown on Saturday 2/11/17. Dave herded the cats into a line and got the meeting started at 10:15. Those in attendance included Al Bailey, Keith Lowe, Rob Tracy, David Fitkin, Craig Huseboe and new member John Thomas of Coralville. There was no financial report available for review. Under old business we discussed that the date and other arrangements for this years’ auction is substantially set and, in keeping with our earlier discussion and decision, promotion this year will be almost exclusively on line via social media because of the poor performance of printed ads the last few years relative to their expense. That said, because the informal survey at last years’ auction indicated it was effective, we will be reaching out to past attendees via a direct mailing to remind them of the auction and emphasize the change in date to a week earlier than in past years. Also, because it costs us only reciprocating in our newsletter for their events, Craig will ask the Illinois club to publish a notice of our auction in their newsletter. 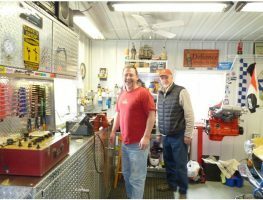 Craig will be sending Dave the mailing list from last year’s auction and Dave will take care of sending out the notices via mail. 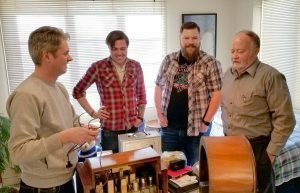 Under new business we discussed how the general effectiveness of social media, especially Facebook, for gathering people with a common interest like collecting, restoring & selling antique radios, continues to increase. 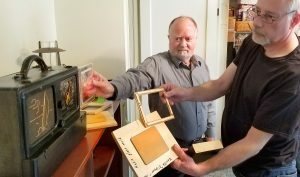 Dave reported that there had been quite a number of responses to his post about our auction on 3 radio related Facebook pages, including some that, upon seeing what had sold in the past on our web page, declared their intent to attend the auction. Dave and Keith have posted notices on various pages already and will post reminders as the time for the auction draws closer. 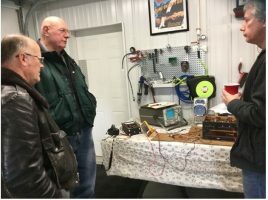 On a related point, Dave said that Doug Spyrison (who could not attend due to illness) had suggested that the club create an Iowa based antique radios for sale page on Facebook. These have become rapidly popular as the fees for services like Ebay have increased. We could also use this to draw people to our general club page and website. There was general agreement that this was worth considering. Dave said he will continue to discuss who and how this may be done with Doug. Finally, David Fitkin floated an idea of how we could use the auction as a basis for extending the reach of our club into the general population, potentially including younger people, something every club like ours desires. The essence of the idea is to approach various organizations in a community such as churches, fraternal organizations, 4-H clubs, the boy scouts etc. and suggest that they could collect radios donated to them and sell them at our auction. Each organization would serve as a single consignor to the auction. 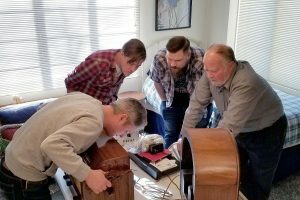 In doing this it would provide a unique fund raiser for the group selling the radios beyond the typical bake sales and spaghetti dinner sorts of events AND give us an opportunity to interact with them, making them aware of our existence & purpose and, perhaps, inspiring some people to join. The consensus was that it’s too late to try and do something like this for this year’s auction but it is worthy of discussion for subsequent auctions. As it happened there were only two sets brought for the groups’ collective efforts to analyze and, hopefully restore them. One of them was a 1956 Harmon- Kardon AM-FM set in which the AM and mono phono amplifier worked fine but with an FM section that remained stubbornly mute thereby addng to Dave’s chronic baldness. 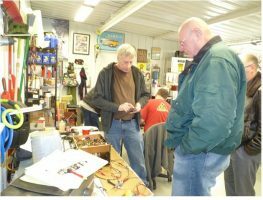 A vigorous team effort ensued and at one point Craig Huseboe and David Fitkin conspiring to suggest that a grounded jumper be place such that a bit of the ‘magic smoke’ was allowed to escape from a power supply resistor. A rapid lesson in smoking cessation relieved that condition with no harm done (the component in question was deemed old enough to legally smoke in any event) then Craig and Rob Tracy teamed up to reach the conclusion that the problem was at least one unreliable, flaky tube socket. So that set was put aside for more detailed attention. restoration. 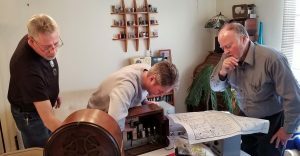 He had no schematic and we were unsuccessful at quickly finding one on line, but undeterred, Keith Lowe helped him dissemble it and visually identified the power supply filter cap. Dave had some suitable caps on hand and while Keith and John replaced them and cleaned the volume control, the tubes were tested and found to be usable. 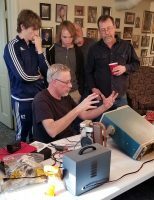 Upon powering the rebuilt set up on a Variac, it came to life and played …… those of us in this hobby know the satisfaction of that moment when your first ever restoration ‘talks’ to you again. It was nice to share in that moment with John and a nice way to bring the meeting to a close. Presumably if you’re reading this you’re aware that we’ve now transitioned to doing more, including the newsletter, via our improved web site (kudos and thanks to David Fitkin for all of the work done on it). Doug, our long time newsletter editor (many thanks to him for doing that time consuming job too) has been posting notices of the change in the last few newsletters, but I’ve still had some indications that, for whatever reason, a few members do not realize that they no long will get either a direct email or, for those very few still getting one, a mailed hard copy of the newsletter. If you happen to hear from or know of a member that feels he or she has been dropped by the club, please direct them to the website. 2016 was a year that was much discussed for many reasons, For me, even though I’m now retired (and happy be be able to say so), it was a year filled with a lot of work on things other than our mutual hobby. I spent much of it through the fall (and way more money than I like to dwell on) working on my home and property with the objective of freeing up more time to pursue my hobbies. After dealing with some minor health issues and making my way through the holidays, I’m happy to report that a project I set aside a couple years ago, a 1955 Harmon-Kardon D1100 has made it’s way back to the front of my electronics work bench. I have aspirations of making this part of an all analog, hopefully all vacuum tube, audio system. But first I’ve got to get to the bottom of a problem with the FM section. As of this writing everything else works fine, AM & phono input (to be tied to a 78 RPM Zenith Cobra changer in my ‘new’ system), and line input all work fine. but the FM is as quiet as a morgue ….. I’ve exhausted the options I have troubleshooting it with a meter, ‘scope and regular RF signal generator (AM modulation only) that I have. I can tell that the FM local oscillator is tracking, but there I got stopped ……….. darn it! I need an FM signal generator – something I’ve never added to my test bench since 99% of the radios in my collection are AM / Shortwave only. Being a long time hobbyist of many interests (radios, general vintage electronics and cars, plus occasionally trying to avoid drowning while Scuba diving) I invoked one of the universal rules of hobbyists the world over: Never pass up a ‘good’ opportunity to buy a new tool. ……. So as soon as my new FM signal generator gets here, I’ll get back to it and hopefully be able to report back to you all next time. In the meantime, it’s not too early to begin thinking about our next auction. 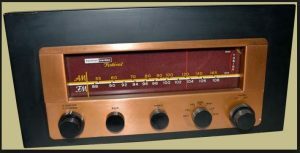 Here again, we’re ‘thinking different’ this year and are shifting out advertising focus from print media (that, according to the informal poll I took at last year’s auction, isn’t working too well) to on-line promotion including on the various Facebook pages dedicated or related to antique radios. This is another way in which you all can help. 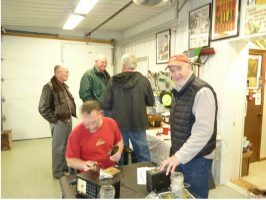 If ever and how ever you engage in discussion of your antique radio hobby on line, please put the word and and be sure to mention that, unlike the past several years, the auction will be the last Saturday in April rather than the in early May due to a schedule conflict our auctioneer has. Thanks to all for your continued participation, keep up the good work and please make use of the expanded capabilities of the club website.